We have accurately calculated the Colors and Reference Colors for each of the 3 Galaxy Note9 Standard Color Gamuts: DCI-P3, sRGB / Rec.709, and Adobe RGB. 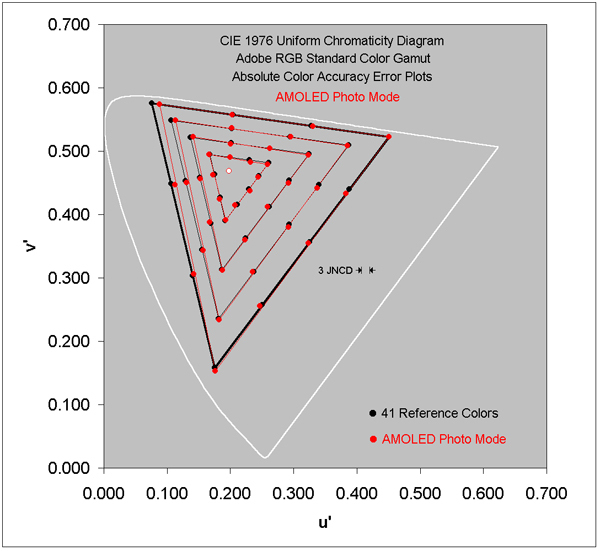 The colors in Figure 2a have been calculated to show the true colors within the DCI-P3 Color Gamut - the colors shown in most published Color Gamuts are wildly incorrect. For an in-depth discussion and analysis of all the Standard Color Gamuts see this article. The Galaxy Note9 has user selectable Screen Modes. 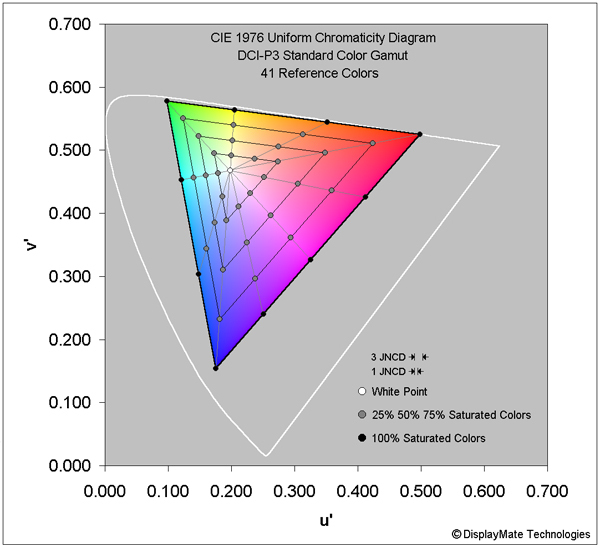 AMOLED Cinema screen mode: Figure 2b below shows the measured on-screen colors for the DCI-P3 Reference Colors. 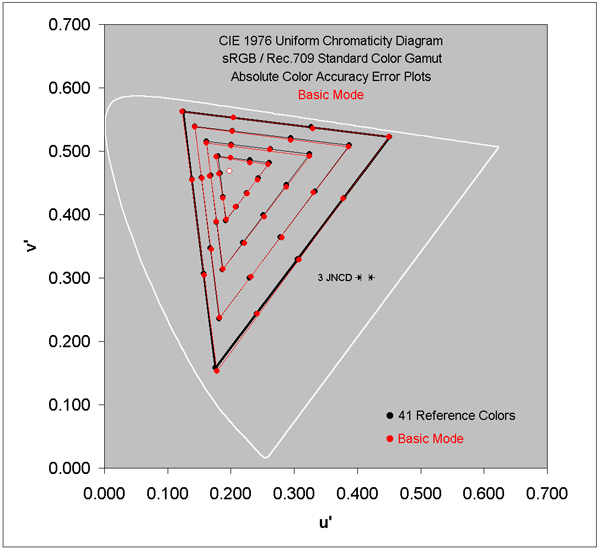 Basic screen mode: Figure 2c below shows the measured on-screen colors for the sRGB / Rec.709 Reference Colors. 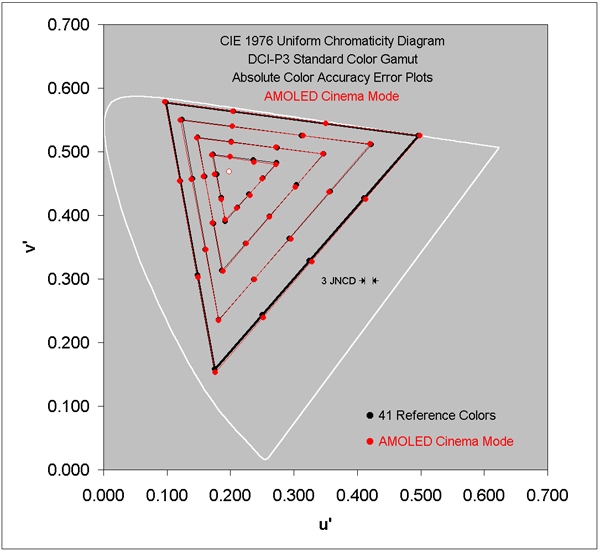 AMOLED Photo screen mode: Figure 2d below shows the measured on-screen colors for the Adobe RGB Reference Colors. The Colors and Absolute Color Accuracy of the display should not vary as the on-screen image content changes. In Figure 4 we examine and measure the Shifts in Color with changing image content from Low APL to 50% APL.